The proposed 2014 mandate for the Renewable Fuel Standard Program demonstrates that the RFS is irreparably broken and should be scrapped. Until Congress repeals the entire RFS, EPA should lower the total ethanol mandate and set the advanced ethanol and cellulosic ethanol mandate to zero. Despite years of trying, EPA has proven incapable of setting ethanol volumes that correspond in any way to reality, especially cellulosic ethanol. 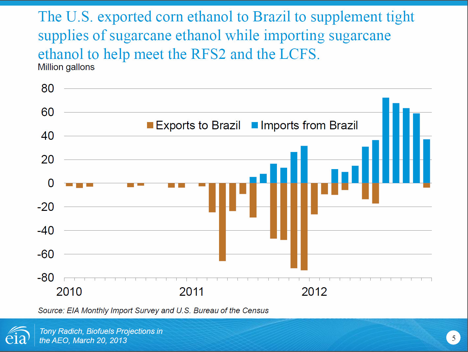 Furthermore, in the name of reducing greenhouse gas emissions, keeping the advanced biofuel standard leads to the environmentally and economically absurd practice of importing Brazilian sugarcane ethanol and then exporting U.S. corn ethanol back to Brazil to replace the sugarcane ethanol. This is what happens when government tries central planning, and that is what the RFS is. The RFS is fundamentally flawed because it is based on the belief that the White House or Congress or EPA can accurately project overall gasoline and diesel demand years in advance, as well as ethanol production and demand. After their projections have proven woefully wrong year after year, it is time to end the RFS and empower everyday Americans to make food and fuel choices, instead of bureaucrats and politicians. The proposed rule sets the total ethanol mandate at 15.21 billion gallons. This is down from the total Congress specified in the Energy Independence and Security Act of 2007 of 18.15 billion gallons. EPA’s reduction is an acknowledgement of the simple reality that there was not enough gasoline being used in America to blend 18.15 billion gallons of ethanol. Through September the U.S. motorists are on pace to use 134 billion gallons of gasoline in 2013. If the mandate remained at 18.15 billion gallons, then gasoline would average 14 percent ethanol—more than almost all cars can currently safely use. While EPA recognizes there was nowhere for 18.15 billion gallons of ethanol to go, they continue to promote “advanced” and cellulosic ethanol to the detriment of Americans. Congress and the Bush Administration were so convinced that more ethanol was the way forward in 2007, they mandated 36 billion gallons must be sold by 2022, comprised of 15 billion gallons of corn ethanol with the remainder being cellulosic or advanced ethanol. Biofuels lobbyists convinced them that it would be commercially available, but they were wrong. As a safety valve, EPA was given the authority to adjust the numbers should the numerical mandates be unachievable. EPA, however, has a track record of grossly overestimating cellulosic ethanol volumes, and has done so repeatedly. Despite the D.C. Circuit chastising EPA for “let[ting] its aspirations for a self-fulfilling prophecy divert it from a neutral methodology”, EPA continues to promote cellulosic production instead of using a neutral methodology and projecting realistic cellulosic volumes. For 2013, EPA mandated 6 million gallons of cellulosic ethanol, so far this year 217,569 “gallons” of cellulosic ethanol have been produced. 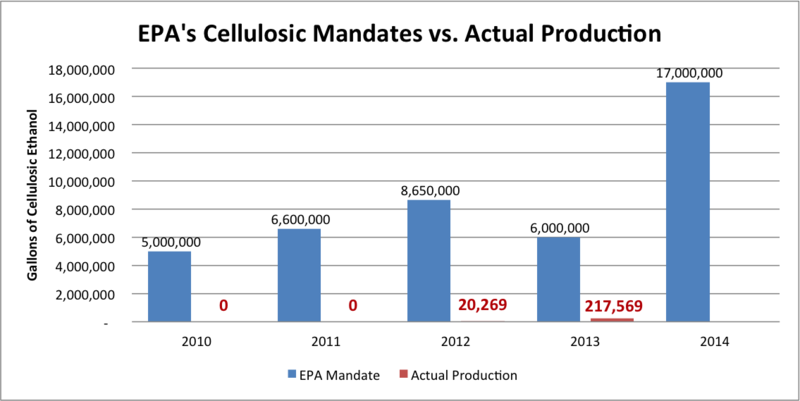 This is ten times as much cellulosic ethanol as was produced in 2012, but there is no reason to believe that cellulosic production will suddenly increase by nearly 80 times to the 17 million gallons that EPA is mandating in the proposed rule. This is especially true because KiOR, one of the only cellulosic producers, missed its 2nd quarter forecast by 75 percent and is now involved in a lawsuit because of alleged misleading statements. 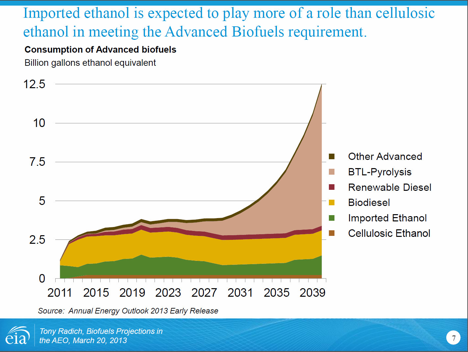 Another problem with the 2014 RFS volumes is the mandate for advanced biofuel. EPA’s 2014 proposed ethanol mandate sets the advanced ethanol mandate 2.2 billion gallons. While it is good that EPA gives a nod to reality by reducing the amount of advanced ethanol required by EISA, it is important to understand what “advanced” biofuels are and why this requirement leads to environmentally and economically absurd results. As EIA explains, “U.S. obligated parties [ie. U.S. refiners] prefer sugarcane ethanol over corn ethanol” because “sugarcane ethanol counts toward the RFS advanced requirement.” Brazilian ethanol users are indifferent between corn ethanol and sugarcane ethanol. This situation is completely absurd. First, sugarcane ethanol is not “advanced.” Sugarcane has been used to make ethanol in Brazil since the late 1920s. The only reason sugarcane is deemed to be “advanced” is because EPA believes it has 50 percent lower lifecycle greenhouse gas emissions than gasoline. The Renewable Fuels Association does not agree with EPA’s assessment of 50 percent lower lifecycle greenhouse gas emissions from sugarcane ethanol. Second, while sugarcane ethanol may have lower lifecycle greenhouse gas emissions, any reductions are wiped out by what happens with sugarcane ethanol in the real world. The preference that EISA sets up for sugarcane ethanol means that not only is sugarcane ethanol imported to the U.S., increasing its lifecycle greenhouse gas emissions, but corn ethanol is then exported to Brazil further increasing the true lifecycle greenhouse gas emissions of sugarcane ethanol. When EPA deems sugarcane ethanol an advanced biofuel, they have to consider its true lifecycle greenhouse gas emissions not only the greenhouse gas emissions required to get the sugarcane ethanol to the U.S., but also what replaces that ethanol in Brazil. Swapping Brazilian sugarcane ethanol with U.S. corn ethanol actually results in overall higher greenhouse gas emissions—not lower emissions, which was supposed to be the point of the advanced ethanol provision in EISA. Worse, swapping Brazilian sugarcane ethanol with U.S.-produced corn ethanol is completely economically wasteful. This swap does nothing, except increase costs and energy use required to swap Brazilian for U.S. ethanol. EIA believes that this absurd trade in ethanol will continue for the next 30 years, with imported ethanol expected to play a much more important role than cellulosic ethanol. Ending the RFS does not mean that ethanol would not be used. What it does mean is that the absurd and inefficient Brazilian-U.S. ethanol swaps would end, that research dollars would be spent on projects that make economic sense, and that the American people would balance the competing uses of corn instead of the federal government dictating a certain amount of ethanol. If the RFS were repealed, the reality is that billions of gallons of corn ethanol would still be used in transportation fuel. One of the most important, and free market, uses of ethanol in the United States today is ethanol’s use as cost-effective way for refiners to increase octane in gasoline. While repealing the RFS would still mean that billions of gallons of ethanol are used, it would end the absurd and economically inefficient swapping of corn for sugarcane ethanol. Without the RFS, the only reason sugarcane ethanol would be imported to the U.S. is because it makes economic sense and the only exports of ethanol to Brazil would occur because it makes economic sense. One of the arguments for the advanced and cellulosic provisions in EISA was to create increased demand for alternative fuels. This argument however, overlooks a simple fact of the size of the liquid fuel market. The global market for gasoline and diesel is literally worth trillions of dollars. Products that economically replace conventional oil production in that market do not need subsidies and mandates from the federal government. The obvious example is shale oil production. Shale oil did not need billions of dollars of subsidies or a mandate that compels refiners to blend shale oil with conventionally-produced oil and consumers to buy it. Shale oil producers saw a huge market opportunity and developed the technology to compete. Because of shale oil, the U.S. energy picture has completely changed since 2007, when the law was passed to reflect that year’s energy picture. The U.S.’s oil production is rapidly increasing because of shale oil production—something a law like EISA did not foresee or take into account. Cost effective ethanol products will find a place in the market, but only if, like shale oil, they are cost competitive. The government can mandate the use of billions of gallons of cellulosic ethanol, for example, but that has not made it economic. Lastly, corn ethanol has been implicated with increasing the price of food by reducing the amount of corn available for uses other than ethanol. The problem with the RFS is the law essentially requires turning billions of bushels of corn into ethanol. In a free society, the federal bureaucrats should not be deciding how much corn to use for fuel; the American public should be making those decisions based on their free choices. Repealing the RFS would empower everyday Americans to make these important financial choices, just as they choose what kind of cell phone or computer to buy. When each of us makes decisions, we live with the consequences, whereas when the government makes decisions for us, no one has the freedom to escape a bad decision. EPA continues to promote environmental and economically absurd practices by mandating artificially higher levels of ethanol production, especially advanced and cellulosic production. There is however, a simple fix—repeal the RFS and thereby empower everyday Americans to make the important choices about what fuel to use and how to balance food and fuel conflicts. Technically, 145,042 gallons of cellulosic ethanol have been produced, but that translates to 217,569 RINs. See U.S. Biofuel Policy, http://sugarcane.org/global-policies/policies-in-the-united-states/us-biofuel-policy. USGA: Em 1927, O Primeiro Grande Empreendimento Brasileiro em Alcool Combustivel,http://web.archive.org/web/20080319112800/http://www.aondevamos.eng.br/boletins/edicao07.htm.